I was introduced to Dragon Ball Z before ever being aware of Dragon Ball. Nowadays I consider both series to be one long series as it originally way in Japan. The popular series by creator Akira Toriyama was split into two different series in North America. 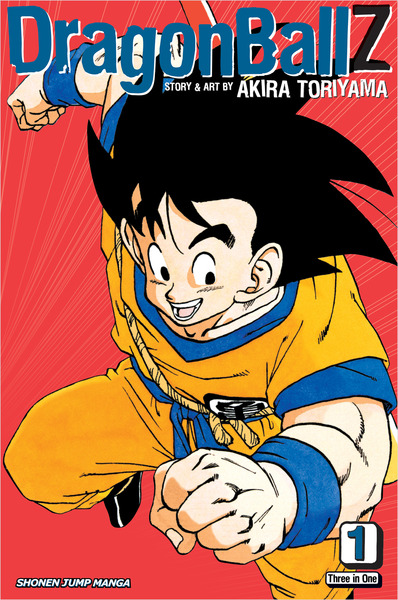 The first series chronicles Goku’s childhood and rise to becoming the most powerful fighter on the planet. The second series tells of Goku’s ever-increasing strength caused by the necessity of regularly saving his adopted home planet of Earth and sometimes the entire universe. I suspect that even if the series had not been split in two we would still consider these volumes of Dragon Ball Z (volumes 1, 2 and 3 collected together in this edition) as a clear departure from the earlier Dragon Ball volumes. At this point in the series the story has pulled away from the collection of Dragon Balls which was more of an adventure story with a focus on martial arts. The whole thing was also a vehicle for Toriyama’s sense of humour which dominated his first manga series, Dr. Slump. Dragon Ball Z focused much more on the fighting component and saw characters becoming increasingly, even ridiculously powerful during its publication. Even in the first volume you notice that loveable characters from Goku’s younger years will be playing a much smaller role during his years as Earth’s champion simply because they’re not strong enough to fight along with him against their new enemies. They still maintain a key role in the series but it’s mostly to provide additional character interactions, character development, and comic relief. The most noteworthy change though is that Toriyama provides one of the most incredible retcon, or retroactive continuity, that I can remember so clearly. He did a radical change in Goku’s backstory by making him an alien. We learn that he’s native of planet Vegeta and he’s a Saiyan, a race of bloodthirsty warriors who completely eradicate planets of their sentient life forms in order to sell off the planets to rich clients. This is where the series attains its vast scope; from now on the outcome of Goku and the Z-Fighters battles will have consequences on the intergalactic scale. There are a few other retcons aside from Goku’s heritage but they all fall under the same category of the story’s overall expansion. We learn that the Demon King Piccolo and his god-like counterpart Kami are not mythological or supernatural beings, they too are aliens. Namekians, to be precise. In Dragon Ball Kami was thought to be one of the higher rankings of celestial officials but we quickly learn that there are other guardians above him with the introduction of King Kay who watches over the north quadrant of the galaxy. The first three volumes of Dragon Ball Z are very impressive. Toriyama manages to completely change his story from an adventure, quest and coming of age story to a grand scale fighting extravaganza on the intergalactic level. The most impressive thing about this change in direction is that he did it without losing the main elements of the 16 volumes that preceded the arrival of Saiyans on Earth. Indeed, many of the characters from Dragon Ball will be present until the very last chapters of Dragon Ball Z. It’s all very different but also quite familiar, allowing fans of young Goku to join up with new fans of adult Goku in enjoying one of the most popular and loved action manga of all time. In an effort to get over my unfounded prejudice against Stephen King and his massive body of work, I’m been sampling some of his books. Even though this is my second attempt to read Skeleton Crew the results have been pretty positive so far. The first time I read this collection of short stories and one novella, I couldn’t get past “The Monkey”. I really enjoyed “The Mist”, so much in fact that I wrote a review of just that story, but everything I read after it didn’t work for me. I wasn’t entirely surprised by this since I’ve found that collections of stories tend to vary greatly in quality and this is true of Skeleton Crew. Some stories were simply bad while other’s had a tone or style that didn’t particularly grab me. That’s not to say there aren’t any good stories. There are but I’m not able to recommended Skeleton Crew in its entirety. Instead, I would recommend the stories I think are the best or at least the most interesting thing and then let the reader decide if they’d like to read the rest. Here are a few quick thoughts on the stories I liked the most. Similarly to ‘Salem’s Lot what makes this story shine is the villagers and how they interact. The core of the story is surviving an invasion on inter-dimensional monsters but the monsters aren’t the focus of the story. It’s a character piece at heart and at just over a 100 pages it pretty powerfully condensed. This is a fun story that also deals with other dimensions. One woman’s passion for finding shortcuts leads her to speeding down roads that few or none others have travelled down before. It has a build but the entire thing is just off kilter enough to work well, even if you know how the story will end by the time you reach the halfway point. I’d like to read more stories like these. There is a definitive supernatural bent but there’s not real horror in sight. “The Jaunt”, is another story that can’t be described simply as horror though there is a clear horror element to it. It’s one of King’s few (so I’m told) science fiction stories. A father tells his family of the history of Jaunting, a form of teleportation that has been popularized in the future. During the telling he struggles to provide a complete narrative while also hiding some of the more unpleasant truths about Jaunting. He fails by leaving his listeners more curious than informed and the consequence is unsettling. This is probably the purest dose of horror in this collection. It’s incredibly straightforward but that simplicity helps it work. Four students go swimming out to the raft in the middle of a lake at midnight. It’s their last time swimming before the raft gets put away for the winter. They’re met by a dark oil slick on the surface of the water which proceeds to terrorize and attack them. It’s a chilling and gory story that completely captivated me. It’s probably the story that engaged me the most from all the other stories in Skeleton Crew. I like this story more for the bookends than the story of the title. Again, it’s a story told within a story. King creates a gentlemen’s club with a never-aging butler and patrons that all seem to have dark secrets. The telling of “The Man Who Would Not Shake Hands” is one of those secret stories. While anybody with a bit of imagination can figure out why he doesn’t shake hands, the atmospheric tone of the storytelling made it a worthwhile read for me. I found King’s second science fiction story in Skeleton Crew to be a disappointment but it was a good disappointing story. The story is too simple and even though I’ve only read a very small amount of stories by King, it has a pretty common structure amongst his work. Characters come face to face with an incarnation of evil, in this case a desert planet that appears to be sentient, and one of them stares into the abyss and is unable to look away, resulting in his destruction. It’s the one story I would have liked to see further developed as it could have been better or at least more interesting than how it is now. A man finds himself the lone survivor of a sunken cruise ship. He’s on an island with no food and a large amount of heroin. The story is told through his diary entries which become increasingly disjointed and strange as he slips into insanity. The best thing about this story is that King takes it to its natural conclusion and I appreciated that. King’s ideas for short stories are generally pretty straight forward with the occasional twist ending. The problem with that is he takes time with his stories. He doesn’t rush to the end and he doesn’t drop the entire idea on the reader in just a few pages. This has the unfortunate consequence of making quite a few stories in this book slow to read and difficult to get through, not because of their difficulty but because it doesn’t successfully engage the reader. On the other hand, his better stories are a delight to read. Even some of the longer ones or those that have a simple idea that doesn’t hide away from the reader or is revealed in a twist ending. Reading “Mrs. Todd’s Shortcut” it was clear that she would find a shortcut but what wasn’t obvious is the nature of that shortcut. Add to that a good style and an enjoyable pace and the result is one of the better stories. 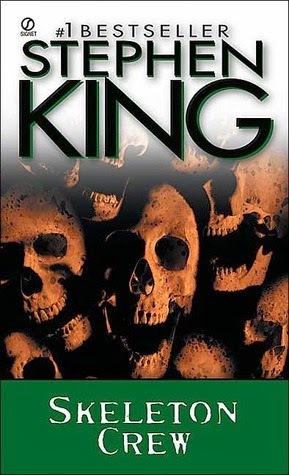 Likewise, “Survivor Type” and “The Raft” are very simple stories but King’s commitment to taking the story to their just conclusion is what makes them compulsively readable and enjoyable (well, a specific kind of enjoyable – they are pretty gruesome) stories.